Christmas traditions in England stem from the many and varied parts or our history. England is an old country and has a long, mixed heritage. England is renowned as a sea faring nation and over the years has brought back to its shores, customs and goods from all over the world. The Christmas craze begins weeks before, when Christmas cards are sent off to relatives, friends, loved ones and business contacts. According to the history books this particular tradition dates back to 1840, and every year more than one billion Christmas cards are sent in Great Britain - December is decidedly not the easiest month to be a postman in England. Another eagerly awaited event in the run-up to Christmas is the nativity play: each year hundreds of thousands of school children act out the story from the Bible about the birth of Christ. They dress up as Joseph, Mary, Jesus, the shepherds and the three Wise Men - and occasionally children get to don ox and donkey costumes. Equally popular are the pantomimes: cheerful musical interpretations of classic fairy tales that are performed by professional or amateur actors - and the audience: crowd participation is a big part of pantomime fun. Pantomimes became popular in England in the 1500s. There are Pre-Christian roots to the pantomime, most notably the playing of men by women and the other way around. This probably stems back to the pagan winter festivals, where roles were reversed in plays: males would play females; masters, servants and children would play parents. Not the oldest of traditions, the Christmas tree may have originated in Germany, but it is very popular in England, too. Legend has it that the first Christmas tree in England was the one Prince Albert, the spouse of Queen Victoria, placed in their royal home. There are lots of trees in public places as well, the most famous being the huge one in Trafalgar Square. The English don't stop at pine trees: holly and mistletoe are equally essential natural Christmas decorations. Mistletoe's popularity obviously has something to do with the custom of kissing the person with whom you stand underneath it - a tradition that allegedly dates back to ancient Roman times, when enemies who met under it were said to have to give up their rivalries. Wassail comes from an old English term 'waes hael' meaning to be well. In Saxon times the Lord of the Manor would shout this to the crowds and they would all drink an ale based drink. This tradition continued over time as people would go from house to house with the drink and Christmas food. Some parts of the country especially in rural areas still go 'a wassailing' in January - usually the 17th which was the old twelfth night. While it's not called wassailing nowadays you'll also find that people in England will still go visiting neighbours for a glass of mulled wine (or something else alcoholic) and a mince pie. Roast Turkey - Christmas dinner in England is usually a huge stuffed and roasted bird, normally a turkey, although goose has featured prominently in the past. The meal is served with all the trimmings, roast potatoes, chestnut stuffing, cranberry sauce etc. 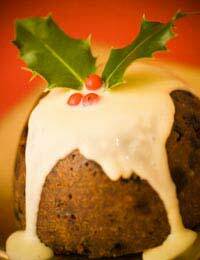 Christmas Pudding - The meal is followed by Christmas pudding, which is typically doused in brandy and set alight. Christmas pudding originates from plum pudding, which was a kind of porridge with eggs, dried plums and meat added. Nowadays it's more of a steamed fruitcake. A silver coin was traditionally hidden in the pudding - to bring good fortune to the person who found it. This was always an old sixpence when we were children, but nowadays 5ps and 20ps are more commonly used. Many a broken tooth has resulted from the 'lucky' person biting into it without realising! Mince Pies - Another 'mincemeat' based delicacy - you'll still find mince pies everywhere from around the 1st December right through the Christmas period in England. Christmas Cake - Those who can still move after a Christmas dinner can indulge in a piece of Christmas cake, a heavy fruit cake, topped with marzipan and royal icing. The most original English Christmas tradition, however, is the Christmas cracker: the popular small paper tubes with little gifts inside were invented by a baker from London in the mid 19th century and have gone on to conquer the world. It is traditionally opened by two people who each pull on one end of the cracker until it, well, cracks. Merry Christmas! Why not have a go at making your own Christmas cracker?